Mark Cavendish has warned fans not to expect too much of him in the Tour of Britain, which starts on Sunday. The opening stage, a 104.8km, eight-lap, flat race around Liverpool, is expected to end in a sprint finish. However, GB sprinter Cavendish, 29, who is recovering from shoulder surgery after crashing out of the Tour de France in July, said: "I will be flat out but I am not in my best condition. "I'm racing because this is my national Tour and I want to support it." Cavendish, who rides for the Omega Pharma - Quick-Step team, won three stages on last year's Tour, which was won by Britain's first Tour de France champion Sir Bradley Wiggins, who will defend his title. Manxman Cavendish, who has won 25 Tour de France stages, will face tough competition from the likes of Marcel Kittel on the sprint stages this year. The German won two of the three Tour de France Grand Depart stages that finished in Yorkshire and London, on his way to winning four in the race. "It's a really strong field at the Tour of Britain this year, the best ever, but you would expect that now the race has earned HC status and it can invite up to 50% of World Tour teams," Cavendish told the Tour of Britain website. "It's going to make for really intense racing but I don't think it will change the nature of the race. "The route seems to be bookended by the two sure-fire sprints but after that almost anything can happen and that keeps a lot of riders interested." France's former national and current time-trial champion Sylvain Chavanel, who rides for IAM Cycling, is among the favourites to challenge Wiggins for the overall title. Steve Cummings, who has twice finished second in the race, leads the BMC Racing team, while fellow Briton and three-time national time trial champion Alex Dowsett is in Movistar's six-man squad. 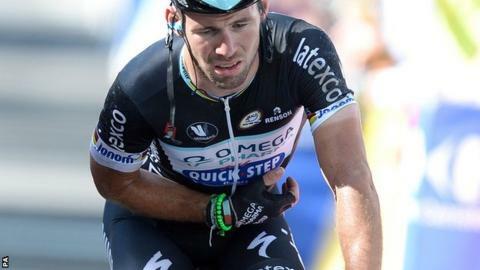 Cavendish will end 2014 without a Grand Tour stage victory for the first time since his first year as a professional in 2007, but he is just pleased to be back racing so soon after damaging ligaments in his shoulder. "I'm just going to enjoy myself and see what the week brings," he continued. "I'm fresh enough but I just haven't got the really high quality racing miles in my legs this season. "After opting to miss the Giro d'Italia, crashing out of the Tour on day one and not recovering sufficiently for the Vuelta I have ridden just one day on the Grand Tours this season, you just can't ever replicate that racing and the fitness it gives you."